NextGen motor oil is now available from Valvoline at major automotive retailers and 500 Valvoline instant oil change locations. The product is made from 50 percent recycled oil and matches the quality of other Valvoline motor oils that use non-recycled base oil. 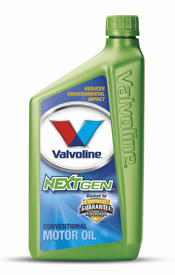 NextGen motor oil is now available from Lexington, Ky.-based Valvoline at major automotive retailers and 500 Valvoline instant oil change locations. The product is made from 50 percent recycled oil and matches the quality of other Valvoline motor oils that use non-recycled base oil, according to the company. Because base oil does not completely wear out — it simply gets dirty — used oil can be re-refined and re-used. Re-refining technology follows a technical process similar to that used for crude oil refining. The manufacturing process offers environmental benefits, lessening the carbon footprint (versus crude refining) while producing base oil just as good as crude. A NextGen video has more information. American cars and trucks use over 3 billion quarts of motor oil each year. The makers of NextGen aim to inspire more motorists to dispose of used oil properly. Consumers and government fleet managers can find out more about motor oil recycling at this site, from where and how to dispose of it to the opportunity to conserve and lessen dependence on imported crude. This site enables consumers to click and show their commitment to closing the loop by recycling oil and using recycled oil products. For each person who clicks, Valvoline will donate $1 to Keep America Beautiful to help protect and preserve environments (up to a maximum of $250,000).